Youth orchestra participants are "good kids." They often excel in school, are dedicated to their instruments, participate in extracurricular activities, are natural leaders and have collectively decided to devote significant amounts of their free time to musical achievement. Private students who participate in youth orchestra often say to me, "Everyone just really wants to be good!" It is refreshing for young players to discover a large new community of peers who share the common goal of musical excellence. Young musicians experience a magical moment when they realize an entire community of skilled musicians exists outside the walls of the school band room. It is inspiring and will allow your child to establish a set of previously unimaginable musical goals. The potential for dozens of new friends from many different schools shouldn't be underestimated! If the moon were invisible we never would have known to aim for it in 1969. The talent and dedication exhibited by youth orchestra musicians is remarkable and contagious. Exposure to such talented peers will help students realign their goals to set of previously unimagined standards. Chair assignments, chamber ensembles and concerto competitions allow students to demonstrate their talents while providing incentives for concentrated practice and achievement. Help your child aim higher by enrolling in a youth orchestra today. The audition alone, regardless of outcome, is a tremendous benefit of youth orchestras. Auditions are an emotional experience with seemingly high stakes. Performing music, with something to lose, can be absolutely terrifying for first timers. Is your child thinking about playing music in college? Imagine about how vested he or she will be in the all important college audition. Students who already have participated in a handful of auditions will undoubtedly perform with more panache when it really counts. Take advantage of youth orchestra and embrace the audition process. Anyone who is serious about music will one day have to audition for acceptance into an ensemble. Many students darn near drown in a sea of unfamiliar sensations during their first audition. I was so overwhelmed with foreign feelings—both physiological and psychological—during my first couple of auditions that I could barely begin to play. My heart was racing, my hands (when I could feel them) were hot and moist, my jaw quivering as though I'd swallowed a massage chair; no matter where I put the mouthpiece-it was on the wrong part of my face. My mouth was so dry my tongue felt like asphalt, and for some reason, all I could hear when I finally got around to playing was how cripplingly bad I thought I sounded. Not. Fun. Thankfully, many auditions and years later I was finally able to manage my nervous system and play my best during auditions. (Please see write-up on audition prep tips here) Oh how I wish I had more audition experience as a youth! Youth orchestras perform authentic, complete renditions of major symphonic works. Directors take great care in choosing wonderful masterpieces penned by the greatest composers the world has ever known. In today's fast-paced cell phone society it seems nearly impossible to get students to listen to a symphony from start to finish. (Believe me, I try...) However, in youth orchestra, students are immersed in the music for three hours a week while actually bringing a symphony to life! It is worth sending your child to youth orchestra for the three hours of weekly listening alone. The benefits of rehearsing and performing significant orchestral works cannot be understated. While all experiences are once in a life time experiences, performing a symphonic masterpiece is truly a once in a lifetime experience, no matter how many times it happens. The process of rehearsing and performing a symphony is irreplicable and, for most musicians, these opportunities become increasingly rare as life unfolds. Youth orchestras reward their most dedicated musical members with international performance opportunities. During the Summer of 2015 the Peninsula Youth Orchestra will be performing in Nice, Avignon and Barcelona; the El Camino Youth Symphony is headed to Spain. Last year, the California Youth Symphony performed in Prague, the Czech Republic and Eastern Europe. What better way to see the world than with your instrument an seventy-five of your closest musical friends! Students in the ECYS Wind Orchestra. Photo permission ECYS. 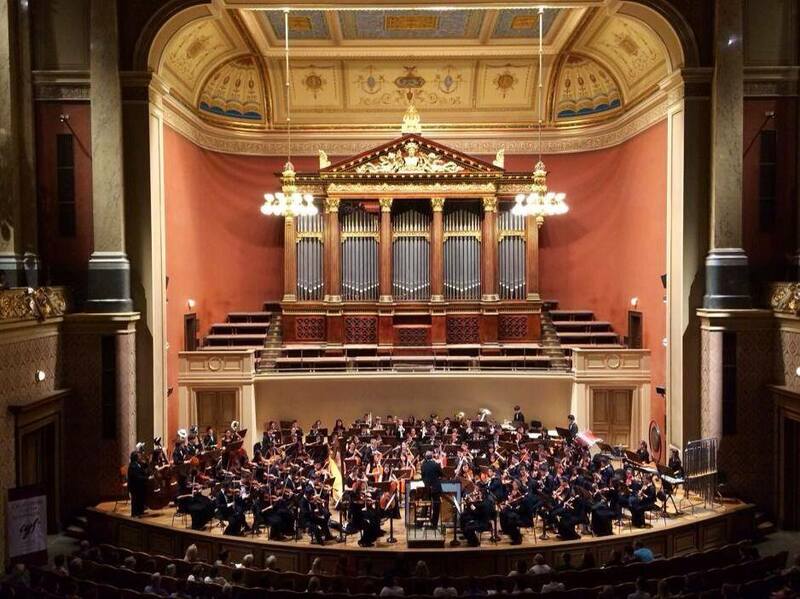 California Youth Symphony performs in Prague, 2014. Photo courtesy of CYS FaceBook timeline.